Since I had missed last Thanksgiving in Virginia due to back surgery, I was committed to going this year. We started off on the Saturday before Thanksgiving in the midst of gloomy cloudy and some rain. Sunday was even worse with misty swirls of rain and even the semis would not drive much faster than 55 through all those hills of Tennessee and so forth. Monday was a beautiful Sunshiney day and we made it in mid afternoon. On Tuesday the cows got out and we got to chase them about a bit, trying to find where they had escaped;on Wednesday i was assigned the culinary duties of the jello molded salad–something I have not done in many years==and the pumpkin pies. 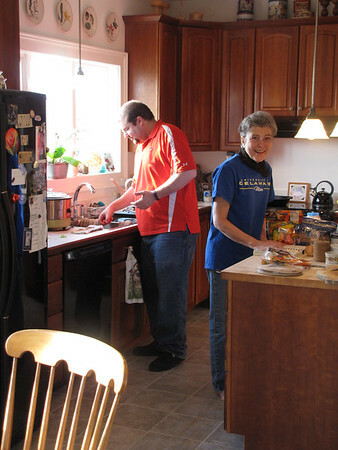 Fortunately Mike, my oldest son, arrived late Wednesday night to take up culinary activities on Thursday morning. Glen and I played frisbee outside for a short time until my fingers were too cold to catch the frisbee and i was too lazy to get my John Deere gloves from my truck. We started back on Friday–did I mention we had snow?? 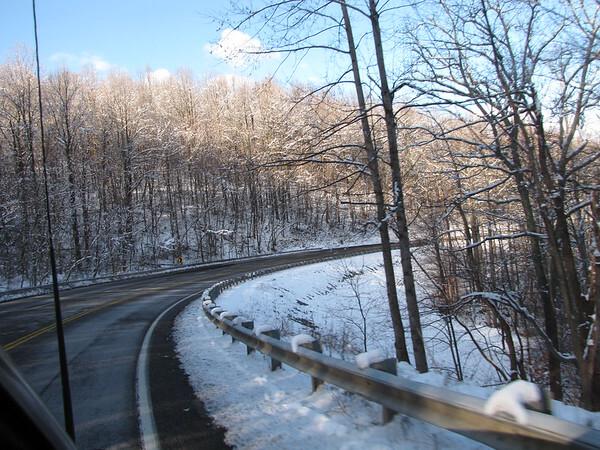 ?–So all through the mountains of Shenandoah National park we saw snow and I tried to take a few photos from the window of my truck while driving. I had perfected the technique while riding motorcycle in Mexico–rule one–never put viewfinder to eye (wearing glasses or helmet) and aim more down than up or you will end up with lots of sky photos, try to aim ahead rather than directly to one side as there will be less motion blur. Returning home is always a relief–but I still hold my breath until we go inside to see that we have not been burglarized while gone. Although I stopped the paper delivery-I found three papers on the sidewalk—a sure sign that we are not home–or at least me–as Glen sometimes leaves them out on the sidewalk and sometimes it is hard to find them stuck in the shrubbery. Then it’s off to pick up the dogs from boarding–they are so thrilled to see us that they can hardly sit still. It’s good to travel and see family and friends and even better to come home.